Greetings from Smoke City, USA! Summer has been preemptively cut short by pervasive wildfire smoke reddening the sun, blotting out the sky and the mountains, and forcing everyone to stay indoors. It’s basically hot winter out here. On the bright side, Missoula’s air quality has just been upped from “hazardous” to “very unhealthy,” so there’s that, and I do have a few pieces of good news to share, so the world keeps on turning. First off, my poem from the most recent issue of Crazyhorse was featured on Verse Daily the other day, which means you can read it even if you haven’t had a chance to check out the crazygood Crazyhorse issue itself. Note: there is a typo on the Verse Daily page. What says “black dad” in the third line should say “black-clad.” Read it here! I’ve also got a poem that’s partially inspired by my yearly attempt and utter failure to sustain plant life (but also loss, making things, etc.) in the current issue of Fugue, the entirety of which you can read online here. Two short poems were published in the current issue of Bat City Review, but it looks like they’re redoing their website, so I’ll hold off on linking that for the moment. 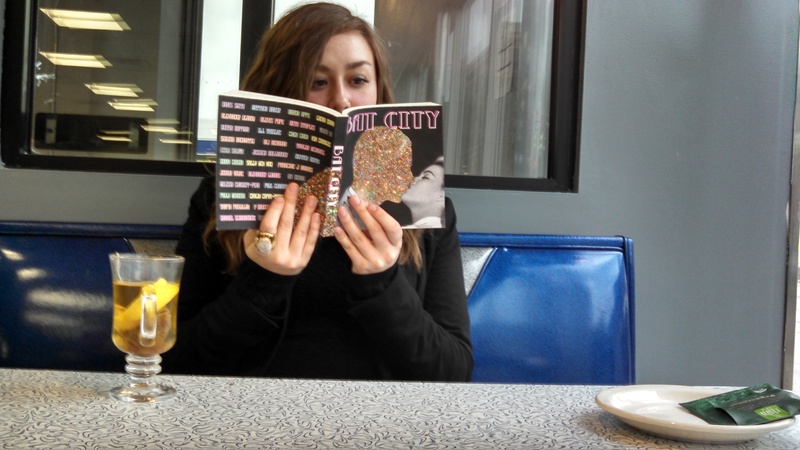 In the meantime, here’s a weird picture of me reading the issue at a diner in Minneapolis! (Posed? Certainly not…that’s definitely how I read things…) There’s some glittery dialogue going on between the cover and the booth-sparkle. I’m also happy to report that Willow Springs published two poems, “Chain,” and “Year of Coming Close” in their Fall 2015 issue, and while you’ll have to get your hands on a print copy to read them, you CAN read a few Ed Skoog and Devin Becker poems as an issue appe-teaser online. Last but not least, the folks over at NightBlock were kind enough to select and publish a poem called “Not Penelope, Although Unraveling” in their current issue, and I’m hanging out in there with some other YesYes Books authors like Emily O’Neill and jamie mortara! This journal can be digested in a sitting, but will keep your poem-brain fueled for a good long while after you get up.